When the world is against you. You’d think it would be amazing. We’ve had six snow days since Christmas. I was ready to teach. Kids seemed to get the concepts. Excitement over ALA Youth Media Awards. Sometimes it is too much. Days where you realize you have had three three-day weeks since Christmas break ended due to snow days. Days when you stare at the calendar, unbelieving, and notice there are only 22 days until state testing. Days when you go to look at sample tests online – just to familiarize yourself – and see this message. So we will have a new format, new questions, yet you won’t give us any examples or help prepare. Thanks, ISBE. Days when you do your taxes and realize you have spend over 10% of your salary on your classroom and wonder what on earth you are doing. Days when your car won’t start, again, for the second Wednesday in a row. And you have to cancel the same appointment you had to cancel last Wednesday when the same thing happened. Days when students don’t read over the four-day break because they are just too busy – their words – and you wonder how you are supposed to reach them. Days when you realize that what you are fighting is bigger than you are. You are one small person in a huge pond. Overwhelmed. Days when you read about more gun violence in schools, more mandates, more charter schools getting vouchers, more, more, more. And jump on the treadmill. And maybe have a few tears escape. There isn’t much I can do about that. If you’d like to know more about Laurel Snyder’s new book, the wonderfully fabulous Seven Stories Up, please check out her post on Nerdy Book Club today (HERE). Then run out and buy a copy. It comes out today and you will want this for your classroom library. Trust me. While I love a snow day as much as most children, I was not rooting for one today. Yet with sub zero temps, a cold day was called. I completely understood the reason – I would much prefer going to school in June to someone getting hurt by these crazy wind chills, I was bummed that my students and I weren’t going to be together for the American Library Associations Youth Media Awards. I remembered last year (you can read my post HERE) and how I had students shouting, hugging, while I cried. I remember the feeling of community that was in my classroom. I would miss that and my Mock Newbery Club wouldn’t have their last breakfast together to watch the announcements, but life moves on. This morning I awoke to the vibrations of my phone. Chris informed me that it had been buzzing for ten minutes while I slept. Flipping it over I saw several texts flying from friends. The awards hadn’t even begun, but the discussion was off and running. I quickly took Bally out and fed her so she’d be set for the morning and then raced to my bedroom to get the webcast set up. Liam stumbled in asking if it had began. When I informed him he still had ten minutes, he mumbled something about getting comfy and snuggled into my bed. A few minutes later Luke moved in, even though he had told me he’d sleep until the Caldecott was announced. They got into position; I grabbed my notebook to write down the winners, my phone for texting, and my iPad for Twitter. We were ready. The awards began with the Alex awards and the energy was up. As each award was announced, I explained its purpose to Luke and Liam. As they saw books they knew – A Splash of Red(Schneider), Knock Knock, Words With Wings, P.S. Be Eleven (Coretta Scott King) they cheered. When I saw books I knew – the titles above and also including Better Nate Than Ever, and The Living, I went a bit nuts. Bouncing up and down next to them, I would try and tweet, but my fingers were flying so fast, I kept making mistakes. By the time the Geisel, Sibert, Caldecott, and Newbery awards came, I was giddy. I love the Geisel award because over the years it has truly captured the books my boys have loved. This year was no exception. My students are going to be thrilled to see Watermelon Seed on this list. It was in our Mock Caldecott unit and several kids had it as their favorite book. After realizing I wasn’t reading much non-fiction and, as a result, my students weren’t either, I’ve made a concerted effort to read and book talk non-fiction more often. I love this year’s books. I haven’t read Mad Potter, but will remedy that immediately. I need to purchase Parrots Over Puerto Rico for my students; I borrowed it from the library. All are brilliant. Oh how I love picture books. They are the perfect text to use in mini-lessons. I think if I taught high school, I would still use picture books often. I love pouring over the illustrations, falling into a story. There were so many picture books I loved this year, and I’m thrilled to see some of my favorites on this list. All four of these were in our Mock Caldecott unit. I can’t wait to find out what my students think when we’re back in school. Fabulous books here. The Newbery. I love this award. I’ve loved reading through former Newbery winners so I can say I have read them all. I had sentimental favorites this year that didn’t make the list, but I do love the books that won as well. What I love most about the winners this year is the wide range of books. I love that humor is represented, as well as a bit of a "scary" book. I love that we have books for the younger side of the age range as well as the older end of the range. I love that there are illustrations in some of these books – and they still won. What a fabulous group of books. This might be one of my favorite years for the entire group of winners. Four of the five were in our Mock Newbery. My students will flip. After the awards were announced I felt like I was positively buzzing with excitement. I wanted to jump on Twitter, tweet out about the winners, talk to friends, and more. My sons nixed that idea, they wanted breakfast. So, in between making an egg casserole, I would hop online – text, tweet, Facebook. Positive energy was flying. I was thrilled to see messages from students already with their reactions. I cannot wait to see them in person and we can truly dive in and study the winners. What an amazing day for children’s literature. Turns out, the energy and excitement was there, cold day notwithstanding. I’m grateful we didn’t have school today; grateful kids are warm in their homes. Discussion about books can continue tomorrow – or whenever it warms up. Today I will chat with the two “students” I have in my home and my friends online. It’s going to be a great day. 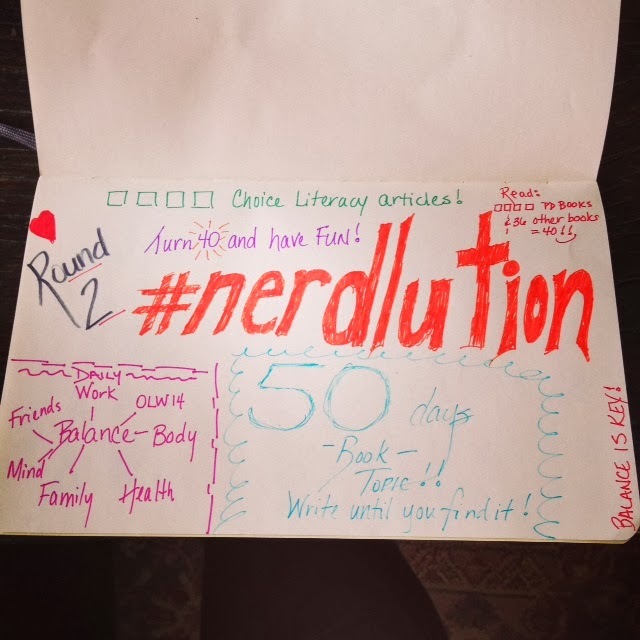 Tomorrow begins a second round of #nerdlution. My first round was a bit of a bust, or so I thought. As I blogged about it HERE, I planned on walking each day and writing each day. Specifically, I wanted to write towards creating a book. And, I failed – or did I? It’s true, I don’t have a book or anything resembling the outline for a book even, but I wrote daily. Sometimes blogs, sometimes in my journal, sometimes a new document on the computer and no idea what would become of it, but I wrote. I also worked towards getting the idea for a book. So many of us talk about writing one – I know because you wonderful people email me and tell me you are just as stuck as I am. That helps tremendously because I know I’m not alone. I love writing, but this is uncharted territory for me. What do I know enough about to fill an entire book? I’m still not sure. There is a nugget of an idea there and I’m searching for it. Until I find it, I will write. I did walk, but not daily. Last night when I was reading tweets from Colby and Franki I thought about my failure at #nerdlution. Then I realized, I probably walk five nights out of seven now, and that’s progress. Before #nerdlution I was walking maybe one out of seven. So what did I discover from those first fifty days? Something I think I’ve known. I need to be kinder to myself. I need balance. (Hello my one little word.) Trying to do something every day was not working for me, but goals are good so I’m jumping back in. 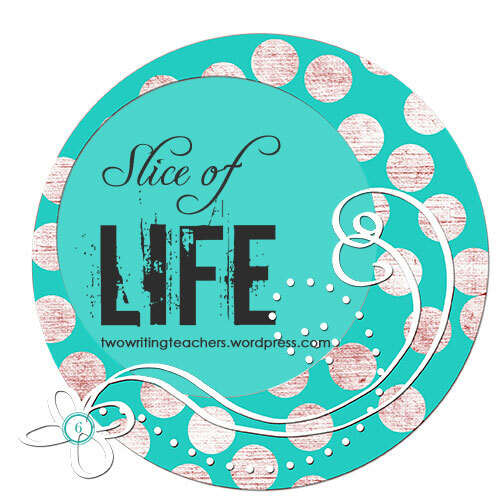 Basically, I want to continue to focus on my OLW – Balance. That’s is a daily reflection for me. Did I try and balance my life that day? If not, there is tomorrow. I want to write four articles for Choice Literacy because I haven’t written any lately. I’d like to read forty books – four of which need to be professional books. I picked forty because I’ll be turning forty during this round. I’m not at all sad about that, I think forty will be fun! And I want to continue to write, and write, and write. My hope is that writing as much as possible of these next fifty days will help me discover my voice and what it is that I want to say. So there you have it, my #nerdlution for round two. How about you? Are you working on anything? Please join us if you’d like. If you tweet, just make sure you add the hashtag into your tweets. Reading in the Wild Chat Tonight! Why is Failure Bad in the Classroom?